Sometimes after having several heavy meals like those feasts during Chinese New Year, I’d personally love to have something light and different. This traditional Italian dish, frittata is one of my favourites. But for my daughter, she is a meat lover, and doesn’t like eating vegetables very much. 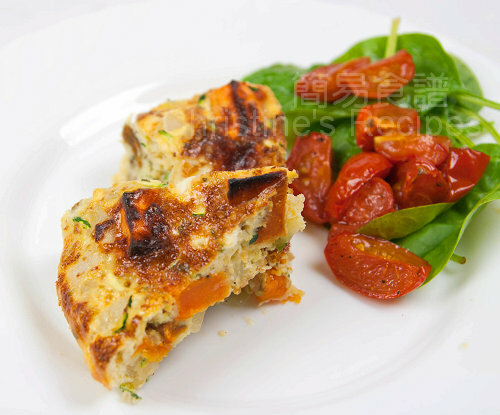 I found this frittata is a great dish to hide lots of vegetables in the cheesy and yummy baked eggs. Amazingly, it works every time for me, enticing my daughter to eat vegetables without any complaints. This recipe was adapted from Coles Monthly magazine, summer edition. When I saw it, just loved it at the first sight. It turned out really wonderful. Here's the video for step-by-step instructions. Adapted from Coles, free summer edition. Preheat oven to 200C (392F). Prepare 2 large oven trays lined with baking paper. Place sweet potatoes onto one tray, drizzle with 1 tablespoon of oil, toss to coat. Spread out to a single layer. Bake for 30 minutes until tender and lightly browned. Place cherry tomatoes on other tray, drizzle with 1 tablespoon of oil and 1 tablespoon of vinegar. Season with salt and pepper to taste. Bake for 15 to 20 minutes until softened. Heat the remaining oil in a non-stick frying pan (20cm diameter). Stir fry the onion over medium heat for about 5 minutes, until soft and lightly golden. Transfer to a bowl, and add the cooked sweet potato. Add the zucchini, cheese and basil to the bowl. Season with salt and pepper to taste, and mix together. Spread loosely into frying pan. Pour whisked eggs into the pan. 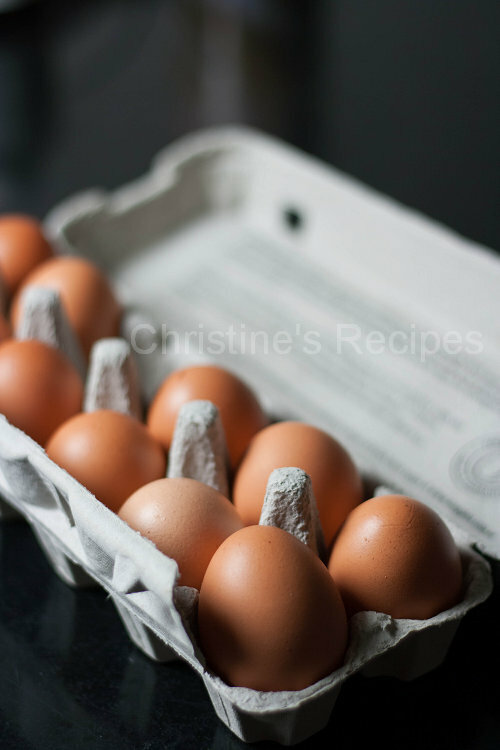 Gently move the filling around to evenly distribute the egg. Cook over medium-low heat for 8 to 10 minutes, or until set underneath and at the sides. Wrap the handle of the pan in a wet cloth. Place under a moderately hot grill, keep oven door open a few inches, with the surface about 8 to 10cm from the heat source, for about 5 minutes, until frittata is cooked on top. (Note: Don’t leave unattended.) Insert a needle. If it comes out clean, it’s cooked through. Remove from the heat and let sit for 5 minutes, then invert onto a large plate. Drizzle tomatoes with the remaining vinegar. Cut frittata into wedges and serve with salad and tomatoes. What a great mix of color and texture with the different combos of veggies. I enjoy making frittatas myself and they are the perfect dish to serve any time of the day. What a smart way to hide vegetables! I love sweet potatoes so this is just perfect for me. I have to try it some time. Oh lovely!! I love eggs so this dish is right up my alley. I used to hate veggies as a child too! I never really started liking them until I was almost 15! However, had it been served this way, well - I would have had them much earlier! The sweet potatoes look especially good in this yummy frittata! 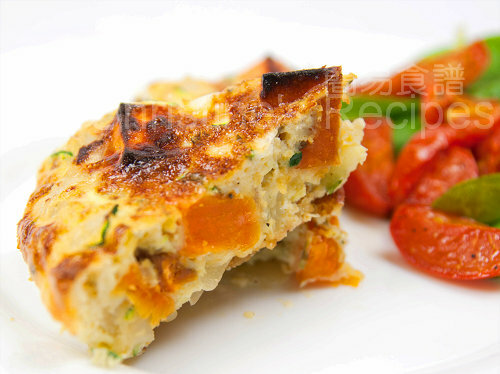 I also love this frittata at the first sight, bookmarked, thanks! Oh my, this frittata looks yummy. perfect for diner with a nice salad. It is a wonderful post CNY feasting :) looks good! Looks great! Any recommendation on the type of cheese? I made this for dinner tonight (with red leicester cheese) and it was delicious!